Cattle grids. Who says they're not dangerous? Be Warned. NOT for the squemish! Have you had an accident involving a cattle grid? "She was a brood mare. She was 13-years-old. She was in foal. She was called Lady Polly. She tried to jump the cattle grid but didn’t make it. She broke her back legs. 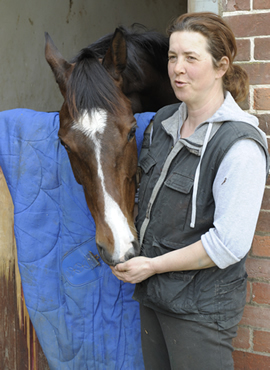 She had to be put down," says Camilla Poulton, who lives in Telscombe Village with husband, Jamie, a racehorse trainer who has knotched up winners at Glorious Goodwood as well as Ascot. "I also had two other horses," she says. “They managed to jump one of the cattlegrids. They landed on the other side. But they both damaged their fetlocks." Camilla, not surprisingly, is one of Jackie Rowland’s greatest fans. "I think what Jackie has been doing is excellent," she says. "Lots of farmers around here are brilliant. They let us ride on their land. But how Telscombe Town Council have been allowed to get away with so much for so long, I don’t understand. But, luckily, we had Jackie on our side." "I had a friend who's horse fell in with ALL 4 feet and we had to call the vet to tranquilize him and then use a cutting torch to get him out. We were really lucky that the horse was an old tranquil gelding because it took about an hour for the vet to get there and another hour for the welder/cutting torch to get there. And to top it all off, it was dark so we were working to get him out by headlights and flashlights." "My neighbor down the road just had to put her third one down. All of them broke their legs and it wasnt a pretty thing to see." I went out on a hack today for about 1 3/4 hours and it was really nice. About 100yds from home he spooked and leapt to the left, I was not at all ready for this because we were just having a cooling down walk before getting home. As he leapt left he went into a driveway with a cattle grid on the end. Unfortunately he saw the cattle grid too late and skidded into it. To begin with it was only his off fore that got caught but as he struggled his near fore went in too, and then he fell to the left, crushing my leg against a wall. I was absolutely petrified but somehow got free of him. I then had to watch helplessly as he struggled to get his feet out, he pulled both his front shoes off in the process but managed to get out and then tried to run off, I managed to grab him and get his shoes out of the cattle grid. I had images of broken legs and severed tendons etc. running through my head the whole time it was happening but he appeared to be ok. I led him home and ran into the kitchen to my Dad in floods of tears, as soon as I had stopped panicking I checked over his legs they seemed ok, a little bit of heat in his off fore, that was the one that got stuck first, and a very small cut near the front of his cannon bone on the same leg, there also appears to be a small amount of localised swelling around his fetlock, but I may be being paranoid. I trotted him up and his is lame on his off fore. 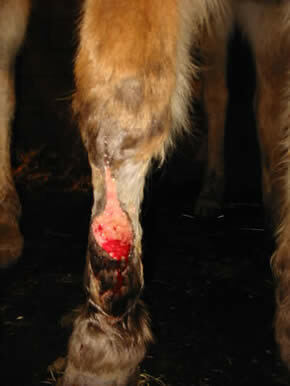 I then went and cold hosed his leg for 15mins and then rang the vet for advice the vet said it sounded like he was just bruised and strained but I was to keep cold hosing it regularly and bandage them over night, I also have to give him bute, an anti inflamatory, just to help with the pain and see how he is tomorrow, if I'm at all concerned I have to ring the vet again tomorrow. It's not at all as bad as I initially thought but I'm still really shaken up by it. I'm very lucky though as there are two types of cattle grids some use rounded bars and some use girder type things with straight edges. Luckily the one he fell down was rounded bars and the pit below was not too deep, if it had been straight edged it would've probably skinned the fronts of his legs. 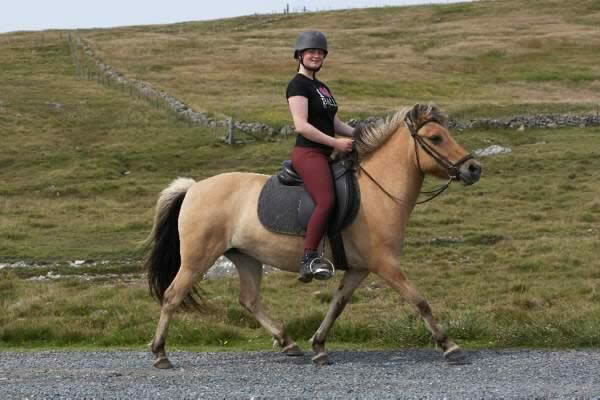 Also, I always hack out with boots on all four legs, without them I think it could've been sooo much worse. I'm sooo glad he seems ok, but still very very shaken up by it all. As you see she is not a light legged, light skinned mare, a TB or Arab with thin skin, or similar type with greyhound skin would have suffered a great deal more. Bear in mind this is the leg of a tough as old boots M&M with bone and hippopotomas hide! Had she been a thin skinned variety it would have been a lot worse. This was after a week of treatment, originally tendons and bone was visible, it was granulating nicely when these were taken. Below is a record of how it healed up. All she has now is a small black scar, her leg is mostly covered in hair again. "I have seen plenty of people have horses and cattle grids and never a problem BUT, after helping shoot a neighbour’s horse that got caught in the grid years ago I would never have one of my horses in a paddock that had access to them." "I had a pony get out and she broke her leg in one. Hate them!." 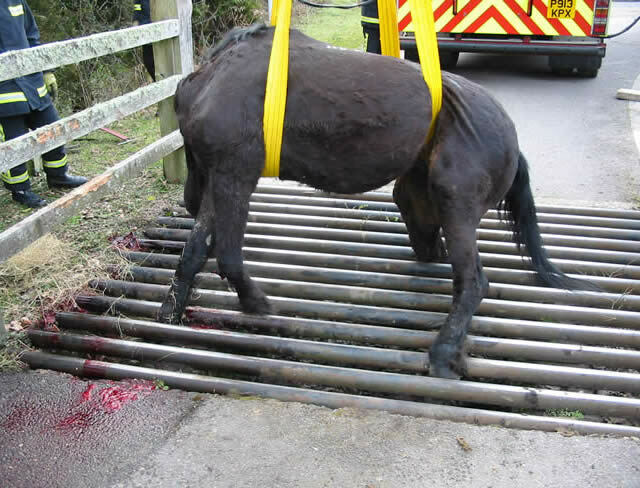 NEVER EVER EVER EVER have a cattle grid where a horse can access it in any shape or form. 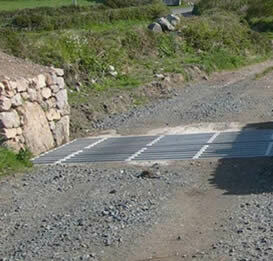 I personally know of two horrific horse and cattle grid accidents. A good friend of mine had had her horse in the front paddock with the cattle grid for many months. One night she awoke to the most horrific sound she had ever heard. The horse was completely stuck in the grid. It had snapped its leg. As if that wasn't horrific enough, the shooting and removal of the horse was just as bad. 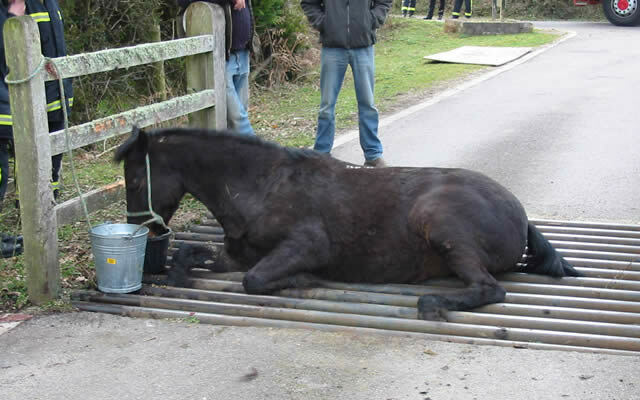 IMHO it is never worth it to even try to have horses anywhere near cattle grids. They are accident prone enough without giving them an excuse to get into trouble.